Net tax receipts were at Rs 4.13 trillion ($65.35 billion) in the first eight months of the current fiscal year that ends in March 2015. The Fiscal Deficit (FD) Stands at Rs 5.25 lakh crore as of November-end almost touched 99 % of the full year target of Rs 5.31 lakh crore. As per the data released by Controller General of Accounts, due to subdued revenue realisation, the fiscal deficit during April-November period was 98.9 % of the 2014-15 estimate. The government is committed to restricting the fiscal deficit at 4.1 % of the GDP during the current financial year, the lowest in seven years, and has taken several steps towards it. The fiscal deficit - the gap between government expenditure and revenue - during the same period last year was 93.9 % of that year's target. The data revealed that government's net tax revenue collection till November end was Rs 4.13 lakh crore or 42.3 % of the Rs 9.77 lakh crore estimated for the whole year. The tax mop-up was slightly higher (44.8 %) during the same period last year. Total receipts (from revenue and non-debt capital) during the eight months of the year was Rs 5.49 lakh crore or 43.4 5 of the target, lower than 45.% collected in corresponding period 2014-15. Plan expenditure of the government during the period was Rs 2.93 lakh crore (51.1 %) and non-Plan expenditure was Rs 7.8 lakh crore (64 %). 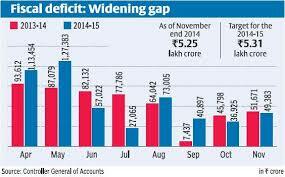 The fiscal deficit was over Rs 5.08 lakh crore or 4.5 per cent of GDP in 2013-14. It was 4.9 % in 2012-13. The government had put in place a fiscal consolidation roadmap as per which the fiscal deficit has to be brought down to 3 % of the GDP by 2016-17. To reduce the fiscal deficit to the seven-year low level, the government has announced a slew of austerity measures aimed at cutting non-plan spending by 10 %.